Researchers have discovered more than 700 ways to prevent or cure diabetes in mice. That has not, however, translated into success in treating humans with the disease. That’s why, Atkinson said, studying human pancreatic tissue is critical to diabetes research. A pancreatic tissue bank housed at UF that is helping scientists bridge the knowledge gap in Type 1 diabetes research will receive $10.5 million in renewed funding over the next five years from the JDRF and an additional $4.7 million from the Leona M. and Harry B. Helmsley Charitable Trust. JDRF was formerly known as the Juvenile Diabetes Research Foundation. With commitments last year from the Helmsley trust of $5.1 million and $3.6 million from the National Institutes of Health, total funding for the bank comes to $23.9 million. News of the renewed funding comes during April’s National Donate Life Month. The tissue bank, which JDRF calls the world’s largest biobank of pancreatic tissue, is known as nPOD, the Network for Pancreatic Organ Donors with Diabetes. It’s both a collaborative network of scientists and a tissue bank, with 50,000 tissue samples from 475 donors. Since nPOD’s 2007 launch, samples have been distributed to more than 300 researchers in at least 20 countries, providing a boon to Type 1 diabetes research internationally. Atkinson describes the biobank as something akin to FedEx in the world of diabetic research, collecting, storing and processing tissue at one site in Gainesville for eventual shipment to scientists around the globe. “We are the hub,” he said. The network works with organ procurement organizations around the nation. It provides samples to scientists without charge after a rigorous review by a panel of prominent diabetes researchers around the nation. The pancreas of a person with Type 1 diabetes does not produce adequate insulin, a hormone that helps regulate how the body uses and stores sugar and other nutrients for energy. It’s an autoimmune disease, although nPOD research has helped demonstrate that stressed insulin-producing cells contribute to the disease’s development. Up to 3 million Americans have Type 1 diabetes. Type 1 diabetes research involving nPOD tissue, for example, has revolutionized understanding of insulin-producing beta cells in the pancreas. Dogma that all beta cells were lost upon the onset of Type 1 diabetes has been proved false. In some cases, only half of the cells are lost. That knowledge, JDRF notes, may help scientists exploit what beta cell function remains, avoid further destruction of these cells and learn how to generate new beta cells. Atkinson said research has helped scientists understand that Type 1 diabetes is more than just an autoimmune disorder and that these beta cells can contribute to the formation of the disease. JDRF officials said the generosity of donors makes these research advances possible. “We believe nPOD has the potential to do for Type 1 diabetes what tissue banks did to accelerate the development of cancer therapies,” said Aaron Kowalski, Ph.D., JDRF chief mission officer. 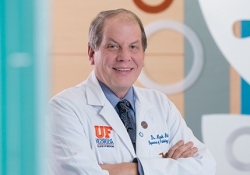 Of the $5.1 million Helmsley Trust funding granted last year, $1.7 million was awarded to Todd Brusko, Ph.D., an associate professor in the UF College of Medicine’s department of pathology, immunology and laboratory medicine and a member of the UF Diabetes Institute.